You’ll love the comfort and support the Peace (S) offers the moment you recline into its soft cushions. Experience the ergonomic design of the Plus and Glide systems as they unite to create the ultimate experience of comfort for your back and neck. 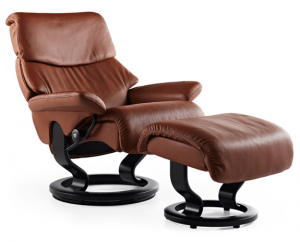 With a name like Ekornes, you know this fashionable recliner is designed with high-quality materials that are built to last. We ship to any address in all 50 United States. Ask for details regarding shipments to Canada. For quality assurance, all Peace shipments must be insured for accident, loss, or damage. Once your shipment leaves our facility, a tracking number is provided via email. Unless otherwise stated, delivery means “to your door”. Shipments must be signed for by someone over 18 years of age.